NASA astronauts Tracy Caldwell Dyson (left) and Doug Wheelock work to set up the ammonia spare pump module after it was installed on the S1 Truss during an Aug. 16, 2010 spacewalk outside the International Space Station. It was the third spacewalk dedicated to the repair. Thisstory was updated at 3:58 p.m. ET. Twospace station astronauts hit pay dirt in orbit Monday after successfullyreplacing a vital pump to restore their spacecraft's cooling system, which hasbeen limping along at half-power for more than two weeks. AstronautsDouglas Wheelock and Tracy Caldwell Dyson wired up a bulky ammonia pump thesize of a kitchen oven into the right side of the space station during thehours-long spacewalk. It was the third spacewalk for the astronauts to make thetricky repair 220 miles (354 km) above Earth. Afourthspacewalk will eventually be needed alter to clean up some final work, butisn't pressing, mission managers said. "Itwas a lot of hard work today and, hopefully, we'll have a pump up and runningand be back in business on the space station," Wheelock said as thespacewalk ended. "Great job guys, we're going to have a lot cooler space station hereshortly," Mission Control radioed back. MissionControl used remote commands to start filling the pump with liquid ammonia. Bylate Tuesday, work should be underway to bring the station back to standardoperations, which should occur before the week is out, station managers said. "Itchecked out great," said space station flight director Courtenay McMillanof the pump. "It is looking good." Thefailure forced astronauts to turn off some experiments and systems, as well asleave others without backups, in order to prevent the station from overheating.Scientific research was stalled as well. NASA station managers have said the ammonia pump failure has beenone of the most challenging repairs for the InternationalSpace Station ever attempted. The cooling system is so critical to stationoperations that a pump repair is one of 14 major failures for which NASAengineers have prepared emergency plans for in advance, they added. While the space station crew tackled the problem in space, a teamof engineers and astronauts on Earth worked round-the-clock to come up with therepair plans. It took two spacewalks just to remove the broken pump from itshousing. That disabled pump is parked in a temporary spot and must be moved toits final perch on a spare parts platform in yet another spacewalk. Thereare four spare ammonia pumps on the space station, one of which was used forthis repair. Each pump weighs 780 pounds (353 kg) and is 5 1/2 feet long (1.6meters) by 4 feet wide (1.2 meters). The replacement pump usedMonday was delivered in 2006. Monday'sspacewalk began at 6:20 a.m. EDT (1020 GMT), about 35 minutes ahead of time.The astronauts swiftly tackled their first chore: removing the new pump from a spareparts platform on the station's exterior. "Youknow, when you're on the [spare parts platform] looking down at the Earth likethis, it's like extreme hang gliding," Caldwell Dyson said. Oneof four bolts securing the pump in place gave Wheelock some trouble when itrefused to budge, but some extra elbow grease and tools did the trick. Afterthat, the astronauts hooked up five power cables and four liquid ammonia hoses. Theysaw no major leaks of the toxic coolant like those seen on the earlierspacewalks. "Gameover!" said a happy Wheelock as he wrapped up the pump replacement. Thereare two main coolingsystem loops ? Loop A and Loop B. The failed pump is in Loop A, while theother cooling loop remains operational. 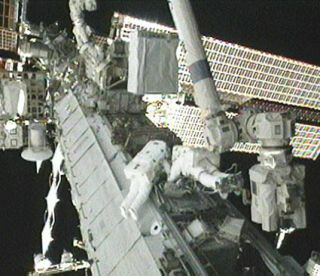 The broken pump was delivered to thespace station in 2002 and was activated in 2006. The$100 billion International Space Station is currently home to six astronauts;three Americans and three Russians. Spare parts are a key concern since thestation is slated to keep flying through at least 2020. NASA plans to fly two moreshuttle missions (in November of this year and February 2011) before retiringits three remaining space shuttles for good. A potential extrashuttle flight, which would launch next summer if approved, is also underdiscussion in Congress. Oncethe space shuttle fleet is retired, NASA will rely on spacecraft from Russianto launch crews and cargo to the space station until American-built commercialspaceships or new government vehicles become available. Unmanned cargo shipsbuilt by the Japanese and European space agencies are alsoexpected to keep the station stocked with supplies. Monday'sspacewalk was the sixth career spacewalk for Wheelock and the third forCaldwell Dyson. It was also the 150th spacewalk dedicated to space stationassembly and maintenance. TheInternational Space Station has been under construction since 1998 by 15countries and five different space agencies. Thisreport has been corrected to reflect that Monday's spacewalk was the sixth forWheelock. Click here for space stationmission updates and SPACE.com'sNASA TV feed.